EMV which stands for Europay, MasterCard, and Visa is a secure method or processing a credit or debit card. It involves a complex authentication which substantially reduces the chance of a retail transaction being made using a stolen or copied credit card. EMV is not widely used in the US at this time, but card associations have created a timeline roadmap for EMV implementation. While merchants may never be 100% required to accept EMV capable cards, there are numerous security benefits to accepting EMV cards in a retail environment, and EMV will become much more common as card issuers replace magnetic strips with chips. 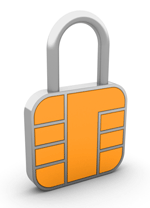 EMV capable terminals must be used with a processor that supports EMV technology. Please contact your processor to ensure current or future compatibility. Even if EMV isn't currently supported, these terminals can still process transactions using the normal swipe methods.